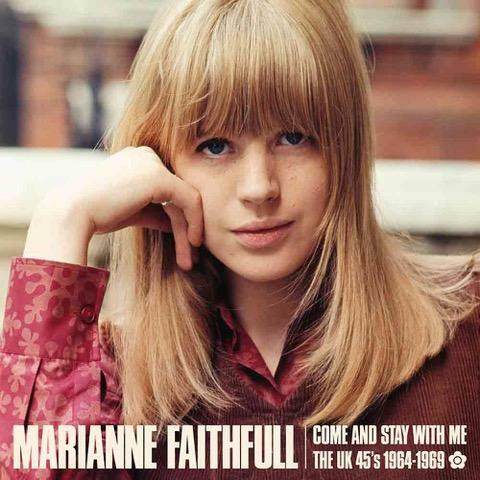 HOLLYWOOD (Perfecxt Music Today0 9/28/18/–ABKCO Records has set the release of Come and Stay With Me: The UK 45s 1964-1969 by Marianne Faithfull on CD and digital platforms for October 26. The 22-track collection is compiled in chronological order and includes all of the legendary icon’s singles from this unique era packaged with rare photographs and extensive liner notes featuring interviews with Ms. Faithfull. In addition to the A and B-sides of each 45 recorded for the UK Decca label in the 1960s, this album also incorporates the entirety of Go Away From My World, her EP All digital album pre-orders will come with the “instant grat” track “That’s Right Baby,” the B-side of her 1966 single “Tomorrow’s Calling.” The song is available on all streaming DSPs now. Marianne Faithfull’s Decca singles are exemplary string-laden UK ‘60s pop and offer insight into both her roots and artistic development. Come And Stay With Me opens with Faithfull’s first hit, her bittersweet 1964 version of the Mick Jagger/Keith Richards composition “As Tears Go By” (co-written with their manager Andrew Loog Oldham who changed the title from “As Time Goes By”), and closes with her original chilling 1969 rendition of the dark song, co-written with Jagger and Richards, “Sister Morphine.” It was later remodeled by The Rolling Stones on their classic 1971 album Sticky Fingers. Born in Hampstead, UK in 1946 to a former British Army spy and a ballerina, Faithfull moved to Reading where, by her early teens, she could be found in coffee bars singing folk songs. Her repertoire included “House of the Rising Sun” and Bob Dylan’s ‘Blowin’ In The Wind,” both of which she would eventually record for Decca and are part of the new collection. After immersing herself in London’s party scene, she befriended Andrew Loog Oldham, who upon realizing that she could sing, quickly signed her. Her subsequent romance with Mick Jagger from the mid-1960s until the end of the decade would become a national obsession. The couple was viewed as emblematic figures of the era, the media fixation obscuring and ultimately hurting her own career. Come And Stay With Me restores the focus upon the magnificent folk (a remarkable rendition of the traditional “Greensleeves,” produced by Oldham) and popular music (including versions of Jackie DeShannon’s “Come And Stay With Me,” Donovan’s ‘The Most Of What Is Least” and John D. Loudermilk’s “This Little Bird”) that Marianne Faithfull created at Decca as she stumbled towards writing her own material and moving towards a redemptive career path. The package also features extensive biographical notes by celebrated music journalist Kris Needs, which are informed by his longstanding close friendship with the singer, and were forged using numerous interviews during the past four decades. ABKCO Records will release the collection on vinyl in 2019. 20) Is This What I Get For Loving You?